In light of recent news events, bullying and its profound impact on people’s lives is a topic that has taken center stage. Many issues appear to instigate bullying, but one issue that has taken hold within the food allergy community is the bullying of children with life-threatening food allergies during school. According to statistics from the Food Allergy and Anaphylaxis Network’s (FAAN) 2009 C. S. Mott Children’s Hospital National Poll on Children With Food Allergies, 3% of parents report having a child with a life-threatening food allergy, and 25% of parents with a son or daughter in elementary school report knowing a child with a food allergy. “With these statistics, though the child may be in the minority, it is definitely not a rare occurrence to have food allergies/sensitivities/intolerances or to be on a special diet these days,” says Lara Field, MS, RD, CSP, LDN, a pediatric dietitian in the pediatric gastroenterology, hepatology, and nutrition section at the University of Chicago Comer Children’s Hospital. Teachers or staff may show indirect signs of bullying by barring a student from certain functions or school activities that may involve a food to which the child has an allergy. For example, a child is allergic to peanut butter. His or her schoolmates are celebrating a birthday during class, and a parent brings peanut butter cookies. The teacher excludes the child from the celebration, and he or she feels “different” and ostracized. Aleasa M. Word, a certified food allergy educator at the Food Allergic Multi-Cultural Society of Delaware, says food allergy bullying is becoming more prevalent, as many unaffected parents and children don’t view it as causing any real harm due to their lack of understanding about the health implications. Although Field has not seen any issues with it in her practice, she believes bullying has serious implications and may cause children with food allergies to consider cheating on their diet or feel pressure to push the envelope. 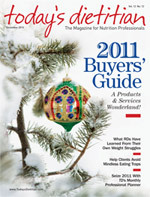 “When it comes to gluten-free diet management, many celiac patients do not have any symptoms and pressure to veer off the diet has very harmful side effects, including destruction of healthy intestinal villi, which leads to poor growth, vitamin and mineral deficiencies, and potentially can put the child at risk for other autoimmune disorders, including type 1 diabetes,” Field says. Additionally, children who are bullied because of their food allergies sometimes stop eating during school, which can result in lower grades if a child cannot concentrate without the proper brain fuel. “Children who also stop eating during school due to bullies can experience weight problems by either overeating once they get home and gaining weight or undereating so much that they can have failure to thrive due to lack of adequate nutritional intake,” Koszyk says. Children who are bullied can also become picky eaters, developing many food aversions, something that can present challenges for RDs when it comes to ensuring children are eating enough and the appropriate foods. Besides the physical effects that bullying can have on children dealing with food allergies, professionals must also consider the mental component, which can be just as severe. Children who are bullied can develop a poor self-image as a result of name-calling. Dietitians, parents, and teachers are crucial players in helping children deal with food allergy bullying. Field begins food allergy counseling by discussing the medical reasons why an individual must avoid specific foods and the consequences of not following the diet. But not feeling left out may be very difficult for children with severe food allergies, such as those who must avoid milk, eggs, soy, wheat, fish, shellfish, peanuts, and/or tree nuts. Field recommends that dietitians provide children with tools to manage their diet (eg, how to read food labels, alternatives to allergic foods, expected dilemmas or challenges with food) to help them feel more confident and less insecure about their food allergies or intolerances. What’s more, by providing education to the school about the effects of bullying on kids with food allergies, everyone can begin to understand the severity of a food allergy and take action to reduce the possibility of a child getting sick or being bullied.